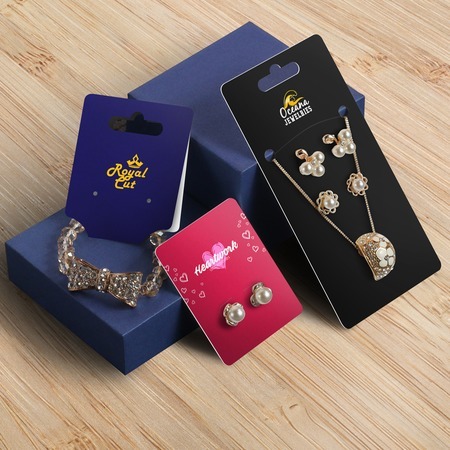 Hang tags help jewelry businesses push all sorts of products — from bracelets to earrings. Jewelry hang tag printing helps to display jewelry professionally and connect you with customers. Hang tags, for example, could contain contact details or a website customers can use to find product information. They can also be used to showcase what makes each piece of jewelry unique or serve as price or gift tags. Are your pieces handmade? Do proceeds go to support local charities or organizations? Are there cleaning instructions customers could find useful? These are just a few examples of what you could include on your jewelry hang tags. To make your custom printed jewelry hang tags truly unique, we’re giving you options to set the style, size, paper type, and even provide a rounded corner option. This way, your personalized jewelry tags are just as special as your products. Our most popular sizes are 2” x 2” and 2” x 2.5” although our 2” x 5.375” foldable hang tags have been getting some traction (it folds down to 2” x 2.5”). As for styles, we have foldover necklace/bracelet, loop/hook earring, post/stud earring, as well as pendant and earring. There are also coating options available: uncoated for those who want to write on their hang tags, matte that offers some shine, gloss which adds even more, and UV coating to make those designs really pop. Note: Foldover tags are shipped with the top unsecured for ease of assembly. If you wish, you can staple or glue the top of the tags to better secure your jewelry.